Indirect Evaporative Cooler — Westaire Engineering Inc.
Our Indirect section is specifically designed and manufactured to increase efficiencies in cooling and air transfer. Our specially designed evaporative core is manufactured on site and is proprietary to only us. The indirect core is highly efficient, providing 60-65% efficiency when 330 to 360 FPM Face Velocity of air is drawn through the indirect core. Our horizontal heat exchanger is extruded from non-corrosive, non-metallic rigid polymer. The surface of the tubes are serrated longitudinally to spread the water droplets indefinatlly until they become a monomolecular layer. The heat exchangers tubes comply with the V-O rating by the UL's subject 94 procedues, which indicate that the tubes hold resistance to high temperature flames and exposed heat combustion and shall not be the ignition souce of a fire. The tubes are solvent welded to a 3/16" thick rigid vinyl manifolds at both ends. By incorporating in our Direct Evaporative cooler with our Indirect Evaporative cooler you get the best of both worlds. You get 2 stages of evaporative cooling while offsetting substantial energy costs. These HVAC's come factory assembled, pre-wired, and are self contained, packaged units. The components and materials utilized in the construction of these models meet the requirements of the United States Government Military standards (MIL-OC-22949C), they also conform to the requirements and standards of recognized technical and industrial organizations through out the industry and bear ETL labels. All parts which are incorporated with water or are water bearing are fabricated from 304 stainless steel to assure long life span and durability. A wide range of options are available for Westaire’s two stage coolers: including heating options, and additional cooling coils. Capacity for standard units range from 3,000 to 25,000 CFM. Larger size units are also available upon further consultation with the factory. 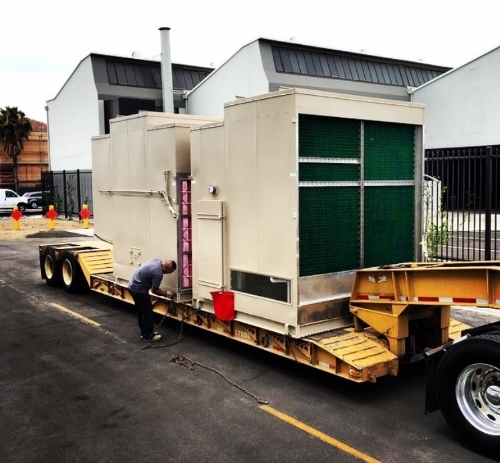 First air is drawn through Westaire's custom heat exchanger to provide the first stage of cooling of the outside air. Then the air continues through our Direct Evaporative cooler where the air is mixed with water to add a bit of moister to the air. This is stage 2 of the cooling process. Then the air is pushed into the building by the fan or blower. These stages of cooling can also be pre-wired to work individually from each other in the case the customer would only like a single stage of cooling either from the indirect or direct.